“A 375ft red squirrel bridge is planned to cross a new dual-carriageway to protect the animal from heavy traffic….Earlier this month, SNP environment minister Michael Russell said the red squirrel was an increasingly rare sight, “but as an iconic species we must do everything we can to protect them”. Mark E. Smith, of the cult band The Falls, admitted to brazenly killing squirrels in his backyard several weeks ago. Now he’s being investigated, since red squirrels in the U.K. are endangered. It’s not known which type of squirrels he was slaughtering. “Squirrels mean nothing to me. I killed a couple last weekend actually. They were eating my garden fence. 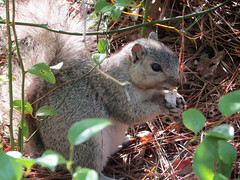 Squirrel lovers in the U.K. have been rightly upset for the past few years, as grey squirrels from the U.S. have started to push out the native red squirrels, which are smaller, cuter and generally more loved among Brits (Squirrel Nutkin being a favorite storybook character). Now the news of a deadly pox virus — of course, from the greys — is setting off more alarms. Squirrels on the pill? Put the pests in a casserole! One solution is birth control. This columnist’s other idea is to eat them. Although I have given up vegetarianism, I still can’t stomach the idea of eating squirrel meat, even if it’s baked into a casserole. But I understand his fretting — it’s not good to have an introduced species wiping out other squirrel species and other flora/fauna. Only in the U.K. would they make a taste comparison to rabbit. Another creature I’ve never eaten, and don’t plan to.